You probably already knew, but this Saturday marked the year’s first Riverside Arts Market. The RAM is one of my favorite local events, and lucky for us, it happens every week! Opening day was bustling with crowds and characters and packed to bursting with vendors and entertainers. Everyone is sure to find something of interest at the RAM, whether it be art, jewelry, live music, face painting, people-watching, or street performers like escape artists and belly- or break-dancers. As you can imagine, I go mostly for the food. Happily we are in the midst of the area’s best growing season and there was an abundance of interesting fresh produce to choose from on Saturday. 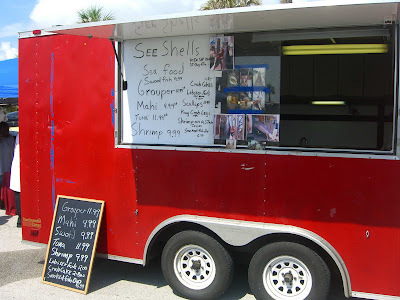 … and breads… …and there’s no shortage of barbecue, grilled grouper tacos, jambalaya, pulled pork, rice and beans, and other prepared foods for an outdoor lunch or afternoon snack. If you live in the neighborhood, why not walk on over this weekend, or take advantage of the free bike valet service. 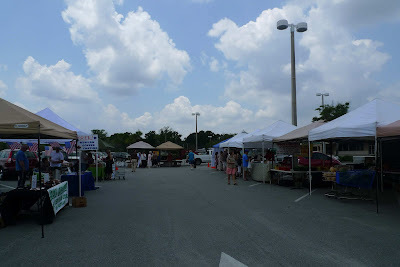 I’m so happy the Jacksonville Farmers Market is just down the road from my place. Now I won’t have to spend so much time complaining about the produce section at the Riverside Publix – plus this market is open seven days a week! 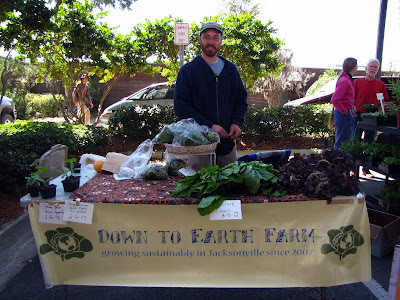 The Jax Farmers Market was completely dead when I visited on a weekday during the winter, but during the warmer months – and especially on the weekend – the place is bustling and fruits and veggies are overflowing the bins and baskets of the many vendors. You can find some Asian and Latino ingredients here. 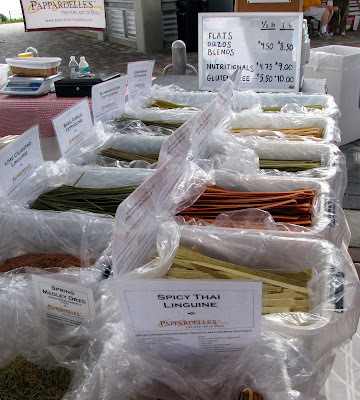 I picked up a few stalks of lemongrass and some bird chiles and there were lots of vendors speaking Spanish and selling yucca, tomatillos, yautia, green and black plantains, dried chiles and the like. But I think the real star of this market is the Southern-style produce. There are friendly ladies hand-chopping chopping massive bunches of collards ($3 for a big bag), baskets of sugar plums, loads of watermelons, bins of peaches, Vidalia onions, and whole or freshly shelled black-eyed and pink-eyed peas. I bought a $3 bag of pink-eyed peas from a vendor who also sells ham hocks and other smoked meats. Yay! There’s also a restaurant called Andy’s Farmers Market Grill (closed on Sunday). 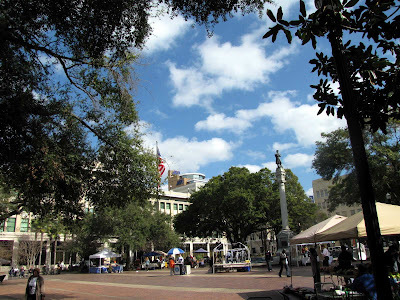 I made an effort to visit the Old City Farmers’ Market every Saturday morning when Phil and I were living in St. Augustine this past summer and fall. Some of the produce vendors were from out of state, but all it took was a little asking around and a keen eye to find the local growers (many of them from Hastings). The Mandarin Farmers & Arts Market takes place year-round in the parking lot of Whole Foods. It's a great weekly option for folks who live on this side of town. 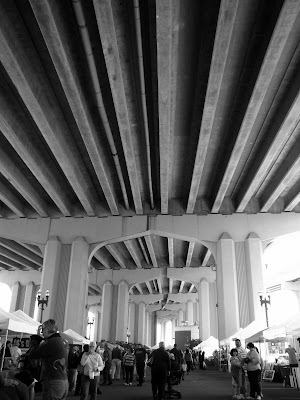 When I went today (a Sunday in August), there were two rows of vendors that set up shop under tents. 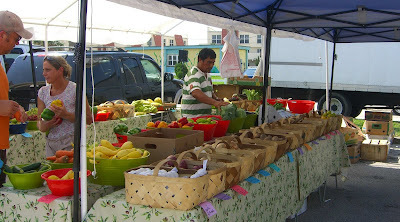 I guess I wasn’t surprised that I recognized a few of the vendors from the RAM and other farmers markets around town. Reeds Groves was there – they’re everywhere, it seems – along with one or two other produce vendors. Reeds Groves are the folks that display their produce in baskets – each basket is $2, or you can pick any three baskets for $5. I also noticed a coffee vendor and Short and Sweet, a purveyor of mini cupcakes and other sweets like Rice Krispies treats and macaroons and brownies. There was also a stall selling only blueberries. That makes me think the Mandarin Farmers Market sells seasonal produce – bet it would be blowing up during the growing season in the cooler months! 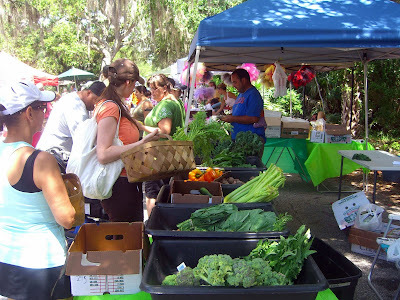 Local Harvest has a nice description of the Mandarin Farmers Market on their website. 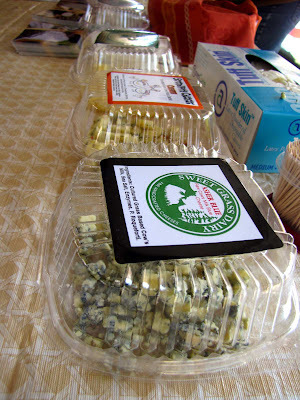 The description promises way more than I actually witnessed at the market – all-natural, grass-fed beef; cage-free organic eggs; goat cheese; shaved ice; heirloom vegetable plants; fresh baked bread; vegan food items; homemade rumcakes and pastries… Check it out to see what they have in store this week! 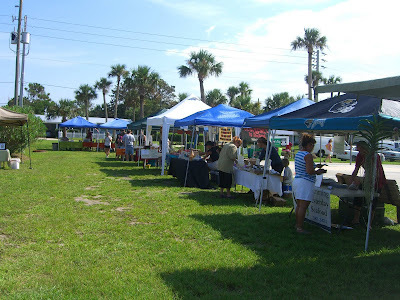 Although an inconvenient day of the week for many, Saint Augustine’s robust Wednesday Market is in a picturesque setting, flanked by palm trees and sand and sun. I was a student working from home while living in St. Augustine, so I was able to head here most weeks. In the summer, the produce always looked so sad and sweaty and hot (so did I, though) and much of it came from states like Tennessee, or even further afield… but I bet you’d have better luck this time of year. 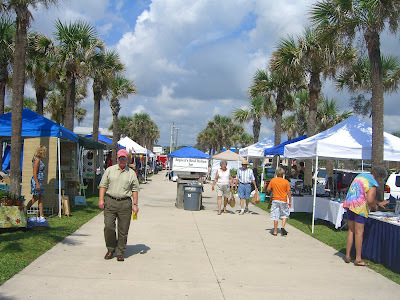 I enjoyed browsing through the crafts, jewelry, and local artwork, and usually picked up a lunch of barbecue or seafood. 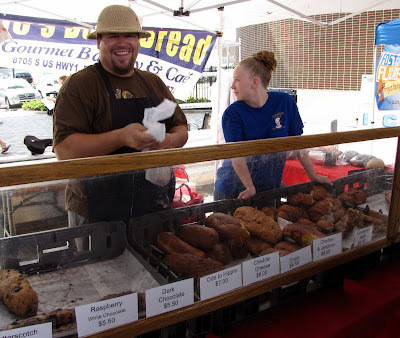 Get out there, explore the markets and support local growers, artists, and producers – one of these markets is bound to be in your backyard, so no excuses! Beaches Green Market is my favorite. The farmers know their stuff! The veggies are just as you said, guaranteed to be local. The Beaches Local food network is picky in a good way about who they allow to sell there. They visit the farms etc. My faves are Twinn Bridges (they service lots of the higher end restaurants in town), Alvarez Farm, Cognito, Down To Earth, and Musickal Acres. Also, nice shout out to Down to Earth. Brian and I went to high school together. Kristen was roommates with my best friend in college! They are great people! We had an opp to visit RAM farmer's market just before we took off for home - picked up the best citrus of the winter! I'm interested in your comments re Brussels Sprout greens, since I left 3 kinds growing in my garden back in Oregon this winter (they grow right through the relatively mild winters there). I love greens, but never thought -or heard- of eating them! Thanks for the idea. 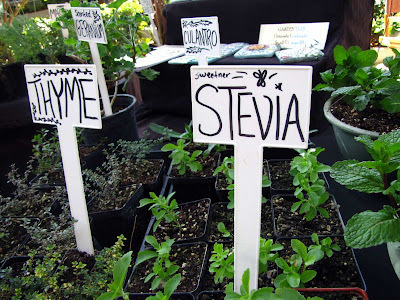 @Natalie - I will look for Twinn Bridges, Alvarez Farm, Cognito, & Musickal Acres when I'm at the Green Market next Saturday! Thank you for the recommendations. I love it when I can get out to the beaches and visit and I always seem to find a cool new type of veggie I've never before tried. Also hoping to make it out to Down to Earth one of these days to see their operation! @drfugawe - let me know how you prepare the brussels sprouts greens! Got home yesterday - have discovered that Brussels Sprouts insist on being picked when at prime - otherwise each sprout simply continues to grow into a new set of branches and leaves! But that just gives you more greens to work with - so I'll start snipping them off and cooking them. I'll let you know how I do them. And in the process, I discovered how delicious are the seed pods that each plant produces prolifically. Thanks for introducing me to a new idea. Very informative, thanks a lot for the post! Please keep on putting up posts like this!